Our white paper library below will provide you with Balanced Scorecard templates, best practice KPIs, and case studies on business strategy best practices. Some risks are known and avoidable, but other risks inherently may come as a surprise and are uncontrollable. They have the potential to threaten a firm’s very existence. 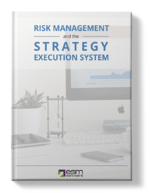 It is only through thoughtful and disciplined risk management that an organization can mitigate the probability and impact of such risks. In an age of unprecedented threats to cyber security, risk management is imperative now more than ever. Progress in the healthcare industry has contributed to remarkable improvements in life expectancy, quality of life, and care. However, a growing share of the U.S. national income goes to healthcare. Can healthcare systems reduce growing costs will still maintaining quality of care? How do you structure effective KPIs? How do you workshop those conversations with your team? 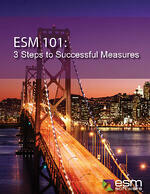 In this guide, we answer these questions and point you towards a sustainable approach to measurements. 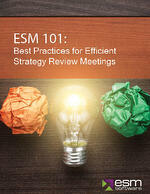 ESM's free Strategy Review Meeting white papers provide in-depth research and proven methods to improve how you construct and facilitate Strategy Review Meetings. 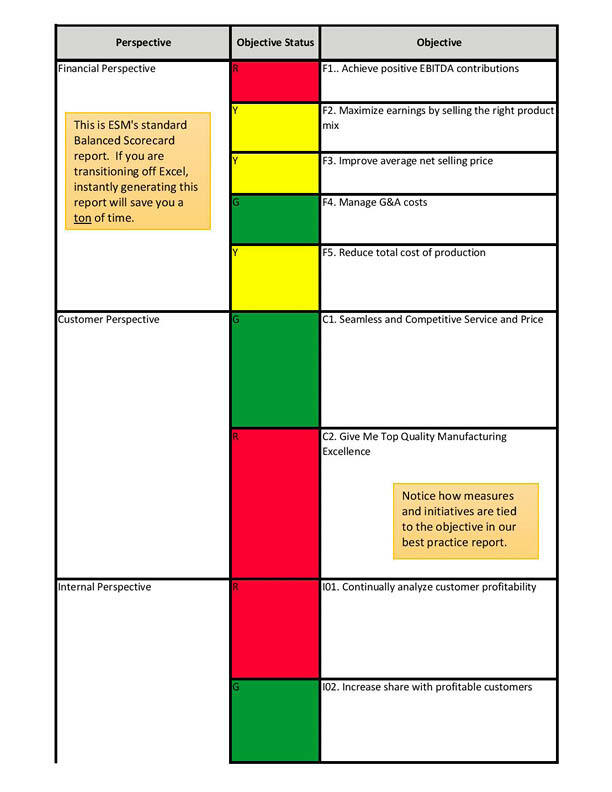 ESM's free Balanced Scorecard examples provide you with a best-practice report to capture your objective, measure, and initiative information in one place. 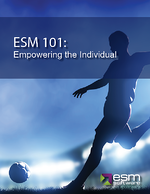 With ESM, you can generate this report anytime, instantly. Implementing change in government organizations — often large, top-heavy groups that must serve equally large (and diverse) constituencies — involves unique challenges. Cash-strapped and often understaffed, these organizations have had fewer resources than companies in the private sector with which to achieve transformation. How are you going to share the plan with your organization? Learn how to improve your internal strategic conversation with Kaplan-Norton research and best practices for your Balanced Scorecard. 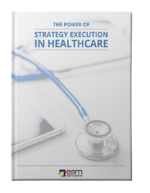 Healthcare systems require notoriouisly complex strategies. 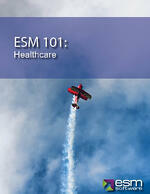 ESM's free Healthcare whitepaper provides best practices from our healthcare clients and case studies. How are you going to put your plan into action? How do you know if you have the right people to do the job? Learn how Personal Balanced Scorecards help motivate individual employees to drive the organizational strategy forward. 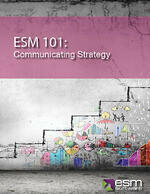 Ready to get started with ESM?